Wash and peel onions, cut into 1/4-inch thick rounds. In a bowl, combine flour, seasonings, and baking powder. In a measuring cup, whisk together egg and milk. Add milk mixture to dry ingredients, blending well. 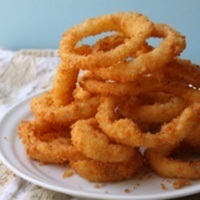 Dip onion rings into batter, then drip into deep fat at about 365°. Fry until golden brown, turning to brown both sides. Remove to paper towels or brown paper bag to drain thoroughly. Sprinkle with a little salt before serving. This is surely economical to make and who doesn't like onion rings..